26. Juni 2014 Carolin Hinz-SowadeVisit Bremen..
Have you seen our brochures and leaflets? 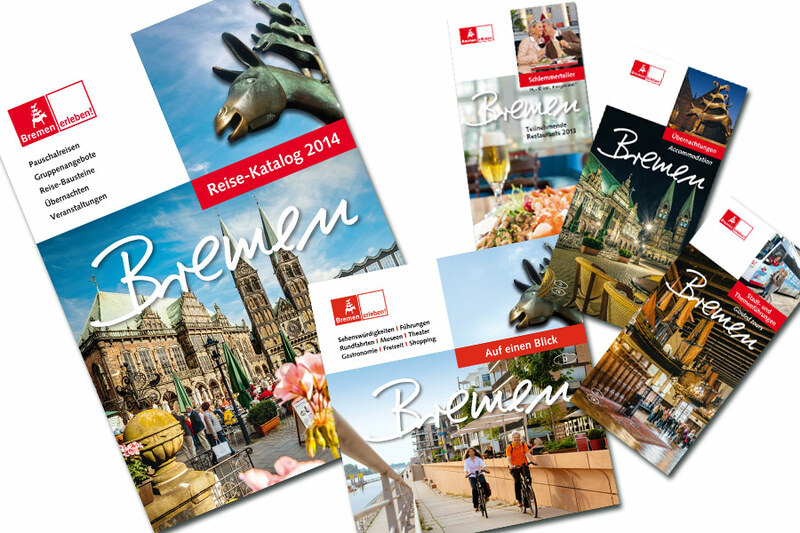 They’re ideal for planning a trip to Bremen from the comfort of your own home – simply order one from us or flick through the online version. Of course, you can find all the latest information on our website too. But, there’s something special about leafing through a brochure – you see things differently. A selection of our leaflets, booklets and brochures promoting Bremen. So, why am I telling you this? We are currently starting the annual process of updating lots of our leaflets, booklets and brochures for the coming year. The biggest job is always the 96-page travel directory that tells you everything you need to know about Bremen’s attractions. It doesn’t have to be finished until November, but it takes some time to get all the texts and photographs just right. Photos are everything when it comes to tourism marketing. Sure, we could just tell you that Bremen is the most beautiful city in the world and that you absolutely have to come and see it, but a pretty picture is far more likely to make you want to discover the city in person. We have a database containing thousands of photos of Bremen. But every time we come to update the brochures, we discover another subject that isn’t covered by this extensive collection. Or sometimes we have relevant pictures, but they have started to look dated. When this happens, we ask photographers if they have any suitable images in their portfolio, or we head out with our own camera or hire a photographer to capture a new picture. On the photoshoot, we regroup at regular intervals – even unusual perspectives, like this view into the clean room, are permitted. 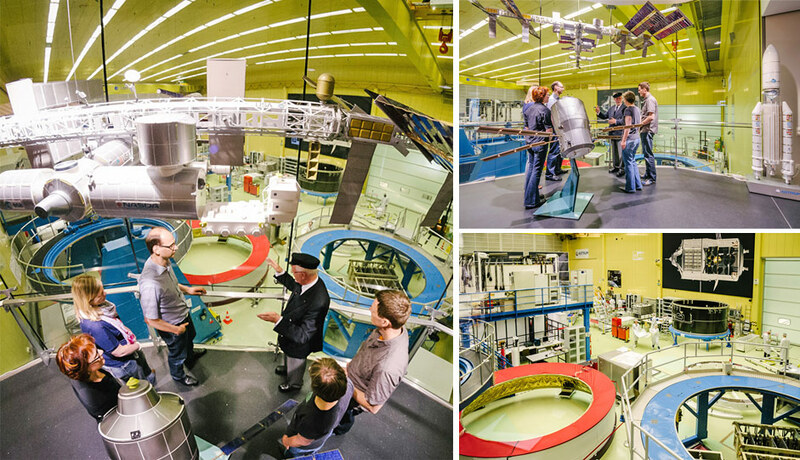 To fully explain how this works, here’s a behind-the-scenes look at our space tour photoshoot . 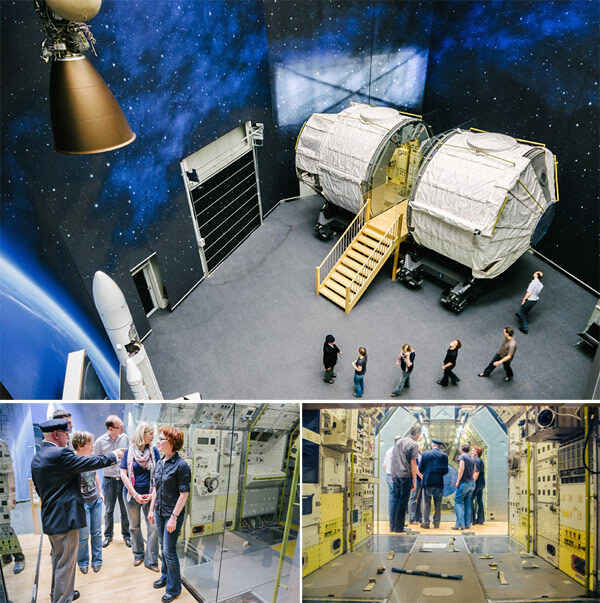 It all began when a colleague asked if we could get new pictures for the space tour. Our existing pictures showed some artefacts that no longer feature on the tour. So, having never been to Airbus myself, I eagerly hopped on the coach with other tourists to make the journey from Domsheide to the Airbus site one Saturday afternoon. Even on the ride there, we learned fascinating facts about the history of aviation and space travel. When we got to the gates of the factory site, we had to show our ID. It was also at this point that we were informed we were not allowed to take photos anywhere on the site. This was a bit annoying, but it’s actually understandable, because we are on a commercial site where highly sensitive aerospace products are manufactured. So, that Saturday, I had to confine myself to making notes about what things would be interesting to photograph. 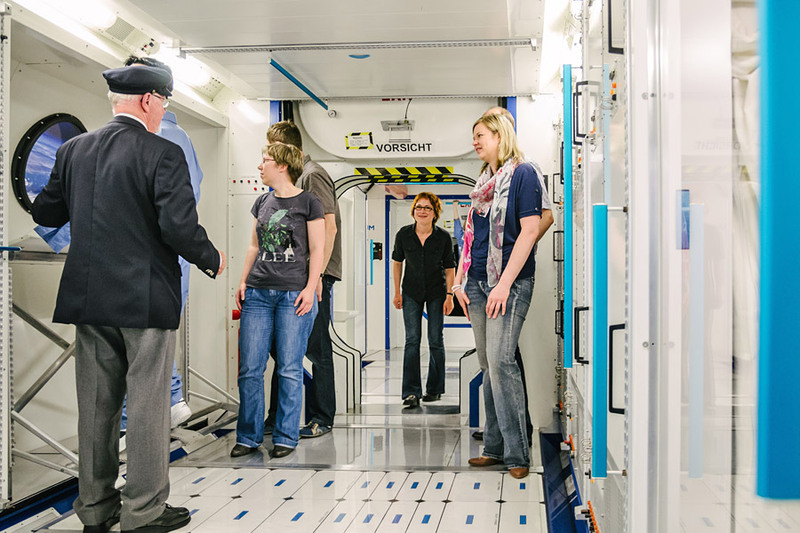 The real Columbus module is in operation on the ISS – this replica in Bremen is faithful to the original and gives a sense of life in space. When I got back to the office, I set about planning a formal photoshoot: setting a date with the photographer and Airbus, finding models, booking a tour guide who could stage a tour for us. And when I say ‘finding models’, I mean I talked a few friends and my colleague Ingrid into appearing in front of the camera with me. Who would want preened and polished models when you could have ‘real’ people like you and me? Off I went with my ‘models’ to meet photographer Jonas Ginter and tour guide Mr Ortmann at Airbus, where I did the tour again, this time accompanied by two Airbus employees. Mr Ortmann was in his element, and was passionate in his explanations about the Ariane and the ATVs that were built at Airbus for the international space station (ISS). And inside the Columbus module of the ISS, he painted a vivid picture of what it was like to be an astronaut. We had to stop him now and then – after all, we were there for the photos, not technically for the tour. And Jonas Ginter kept getting us to gather around particular objects to make sure we had a good selection for our brochures. 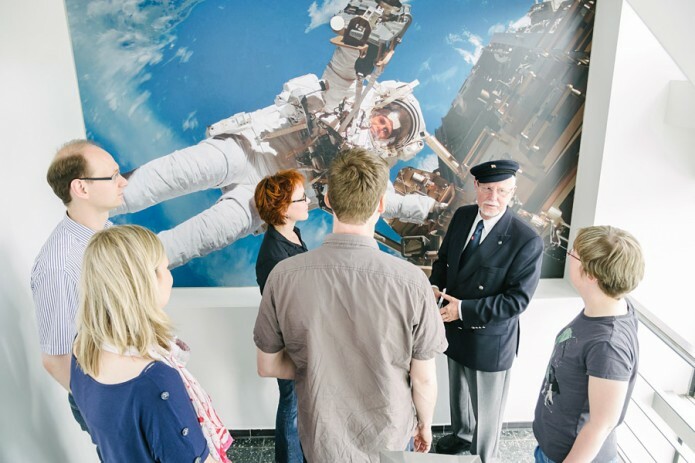 Just as he would on a real tour, Mr Ortmann tells us all about the Columbus module of the ISS – while Jonas Ginter takes photos from every angle. After around two and a half hours, we had finished the photoshoot, but the project didn’t end there. Jonas Ginter still had to go through the photos and edit them before he could send them to us. We then had to get Airbus’s approval of the images, in case we had, despite all precautions, captured something that could not be shown in public. I also took a few snaps of my own during the tour. Though they are perhaps good enough for Facebook or Twitter, they certainly don’t come close to the quality of Jonas’ photos. Even these pictures had to be given the green light by Airbus. The Spacelab has 22 space missions to its name. 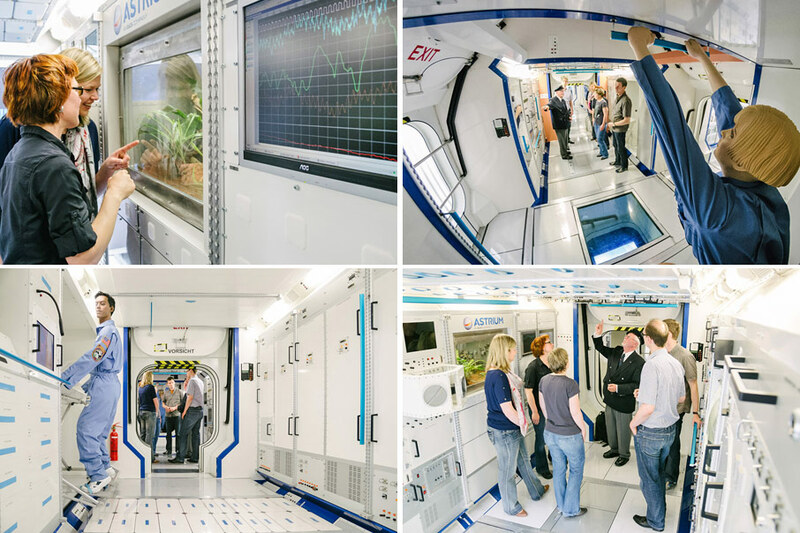 And you can visit it as part of the space tour in Bremen. Thanks must, of course, go to Jonas Ginter for the excellent photos.